*This is a long post, but if you're a writer (or a fan of these authors), read on!! Saturday, Heather and I went to Teen Book Con here in Houston. We sat in three of the five available panels (and we may or may not have sat in one twice! ), and while the event wasn't focused on giving writers advice and inspiration, since I am one, I took lots of notes, and I'm going to share the gold with you! Please don't take these as direct quotes from the authors--I wrote as fast as I could while they were talking, but I'm sure some of it got paraphrased in translation. -Quoted Nietzche, "Become who you are." -If I get a bad review, they aren't giving me the bad review. It's just a part of my job. -A book is a snapshot of someone's life, and it's usually the part where the conflict is. -Actually wrote Sean Griswold's Head first, but was rejected by 20 agents, so she wrote Princess for Hire, which was published first. -Is a big fan of the happy ending, which is one reason she isn't currently writing a series. The second book always messes up the happy ending the first one created--especially books that were turned into a series only because the public wanted it. -Was fortunate enough to get her dream agent very quickly, and her dream editor. -Has learned to treat writing like a job and not her "life". Last year it became her "life" and it was a very bad time for her. You have to keep time for yourself, for family, friends... and keep the time to work in it's designated space. -How I'm feeling can go into the book and the book can influence how I'm feeling. -Once spent two weeks working on the first line of a book because she knew the rest of the story would flow after that. It's what worked for her. -eavesdrops and steals info--keep eyes and ears open to everything around you. -Dead Girls Don't Write Letters was inspired by a conversation she overheard after making the wrong turn somewhere and her window happened to be down (talk about CHANCE). -on writer's block: "If I'm blocked, I'm doing something wrong." She writes a letter to herself from the POV of her character. -on writer's block: Likes to do something physical, like take the dog for a walk. It gets the energy flowing. -Does quite a bit of research by asking her readers online about their personal experience (for example if people have recovered from drug abuse, etc, to learn how it feels so she can describe it authentically). Combo of Hawkins and Mitchell on what they think when they read a synopsis of someone's story and it sounds just like their story: There are a lot of similar story ideas, but every writer is different. Give all five of us (on the panel) the same prompt, and in an hour you'll have five completely different stories. -When the story screeches to a halt, something in the foundation is broken. -on block and revision: Change the font. It opens something up when you see it differently on the page. -on why she started writing: Had always been interested, but one summer she intended to practice riding horses (there was way more too it than that), and the very first day the horse she picked out stepped on her foot and she couldn't walk for 12 weeks. She sat on the couch with her laptop and said if there was ever a time to do what she'd been talking about doing (writing), now was the time. -on block: Makes a music playlist that fits with her story, and listens to it on walks. The music combined with physical activity is inspiring. 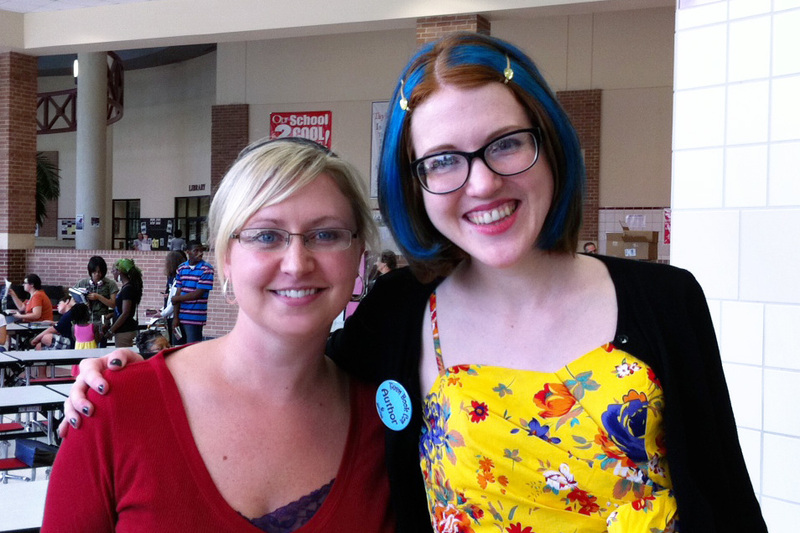 Here is a picture of me with Anna and the French Kiss author, Stephanie Perkins! So... I figured this event was a good excuse to temporarily lift my book buying ban. Here are my new goodies, all signed too! to get personalized. Stephanie is so sweet and down to earth. She's incredibly surprised and thankful by the warm reception Anna has been getting (she had one of the longest signing lines at the event). She looks you in the eye when you're talking to her, and really appreciated everything we had to say. I told her how I bought it for myself on my birthday, and stayed up until 3am because I couldn't put it down until I came to a good stopping point. I also shared that I made my mom read it, and she called me when she was done to ask me how long it takes to recover from such a good story being over. My answer was that I still haven't recovered, so good luck. All the authors were fabulous, but there is definitely something to be said about personally connecting with them. Elizabeth Scott got up from her table to give me a hug after she signed Perfect You for me. Does this make me want to read all of her books now instead of just the one I bought? Absolutely. but we still chatted with the authors because they are fab (and because I hadn't actually MET Andrea Cremer before). Check your local events and see if you have an author signing near you sometime soon. There is no greater inspiration than rubbing elbows with people that have made it happen. I went home and wrote 1700 words Saturday night, and I'm making writing a part of my daily schedule. I'm going to become who I am. I somehow ended up as the first person in Stephanie's line, and I just gushed and gushed about her book and how much great writing advice I've taken from her blog. She was so very sweet and talkative -- it's good to know she stayed that sweet as the signing went on. Her line was SO busy! I picked up the same books as you, too. I have a lot of reading in my future! I'm so jealous! What an awesome experience! I absolutely adore Deb Caletti! (I'm reading Stay now) and Stephanie Perkin's first book was such fun that I'm looking forward to more from here. Cheyanne - how cool we were at the same event! We'll have to meet up at a signing sometime! Katie- It was so great! And Stephanie rocks my face off! Hopefully more authors will head your way soon! Kim - I'll have it in the mail by tomorrow at the latest! it's all wrapped in fat bubbles, just needs a pouch and to be sent! I had so much fun and learned so much from all these ladies! OH! I forgot about our SWAG! My very first ARC! Awesome, awesome post! So inspirational! And yes you need to read all of Elizabeth Scott's books she's one of my favorites! Sounds like a cool type of event to attend. I am on the look out for something like this in my area. Thanks for the run-down.